In a future blog I’ll be giving a rundown on my trip to West Africa, especially when I have created some art from it. However, since West Africa isn’t exactly blessed with wildlife, being so full of people, I had to get my animal fix on the way back home at Frankfurt Zoo. Yes, I flew the long way home with a very complicated business class ticket created out of cheap points (just to make you jealous, flying business class all the way from Adelaide to Accra in Ghana (and back) and using the flash lounges in the various airports, cost less than an economy airfare by playing the game of using Star Alliance points and matching up the various airlines in the network. More of that another time). 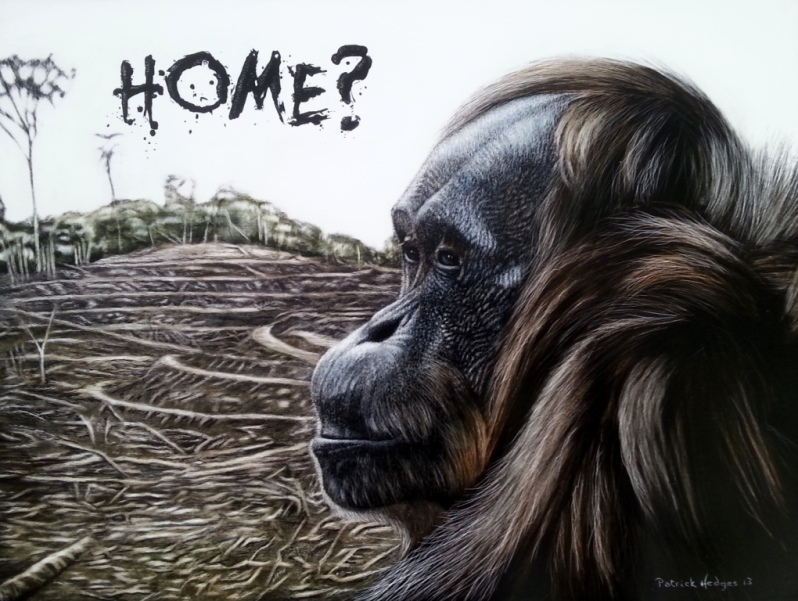 In the Frankfurt Zoo I saw this orangutan and coupled with West Africa’s lack of wildlife (displaced, destroyed or eaten) and the orangutan’s own Indonesian issues with homeland being decimated to make way for our insatiable urge to produce palm oil, I created this protest piece. Sometimes you come to a point where you say “enough is enough”. 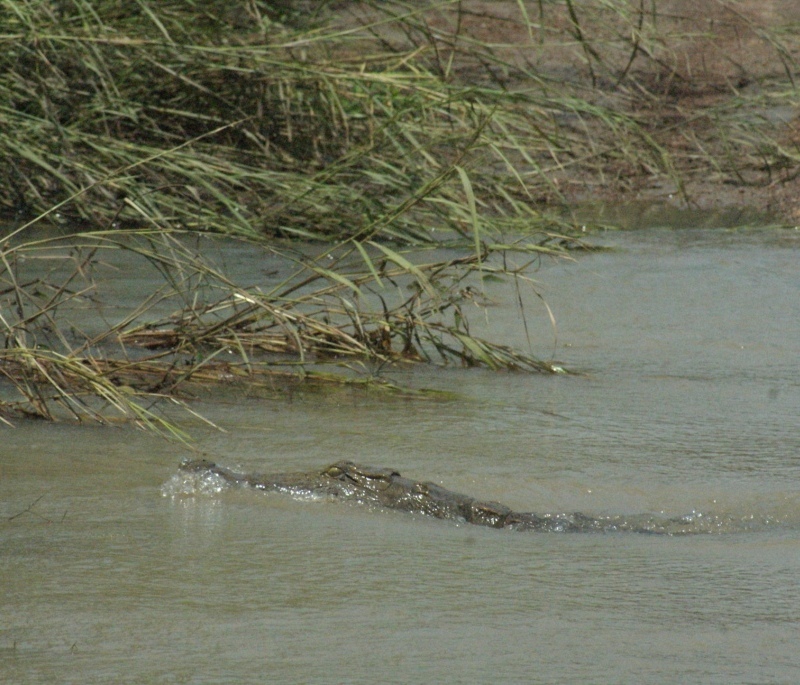 That point came for me when all I saw of wildlife in West Africa were goats and lizards. I guess you can’t eat lizards and they are not going to hurt you, so they stay safe. Snakes and other reptiles are pretty much gone and goats are everywhere, destroying the soil. We did get to a national park but it was the end of the rainy season and the elephant grass was so tall that we didn’t see much. Having said that, it was still a great feeling to be there. I have one funny story from that park. A river runs through it and with the recent rains, this river was impassable up until the day we tried. When we got to it, the level had dropped but the driver was still unsure of whether he could get through. He asked us to get out and wade across and he would follow in the Jeep. We told him “NO”!! So we drove across in the Jeep – fairly easily. When we went to leave the park in the afternoon we arrived back at the river, and there, exactly where we were told to walk across – by a professional no less – was this! (You can see our old tyre tracks just beyond it). 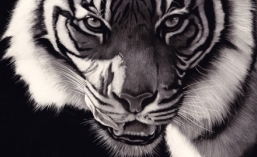 So there you go – trust your own instincts! This entry was posted in General interest, Travel blogs. Bookmark the permalink.